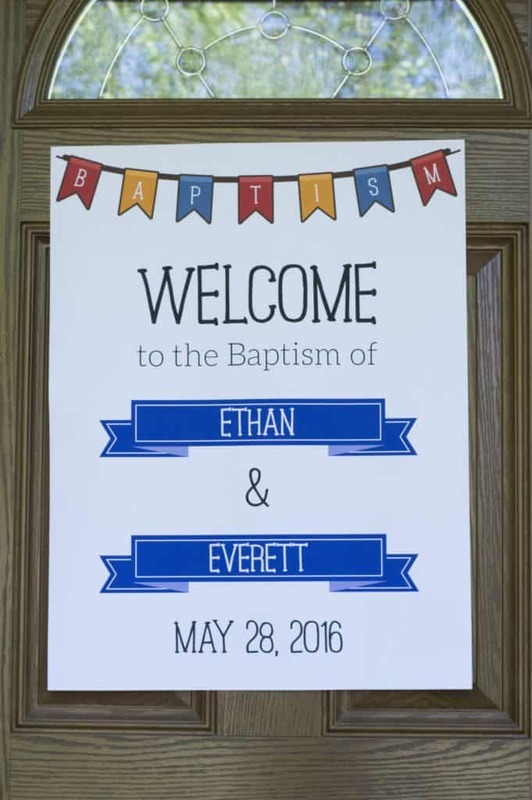 My boys were recently baptized over Memorial Day weekend into the Serbian Orthodox Church, my husband’s family’s religion. 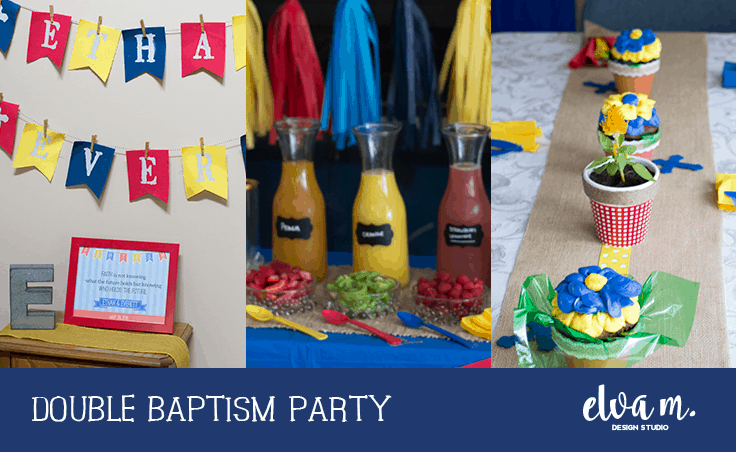 After Church we celebrated at my in-law’s home with a baptism party luncheon. 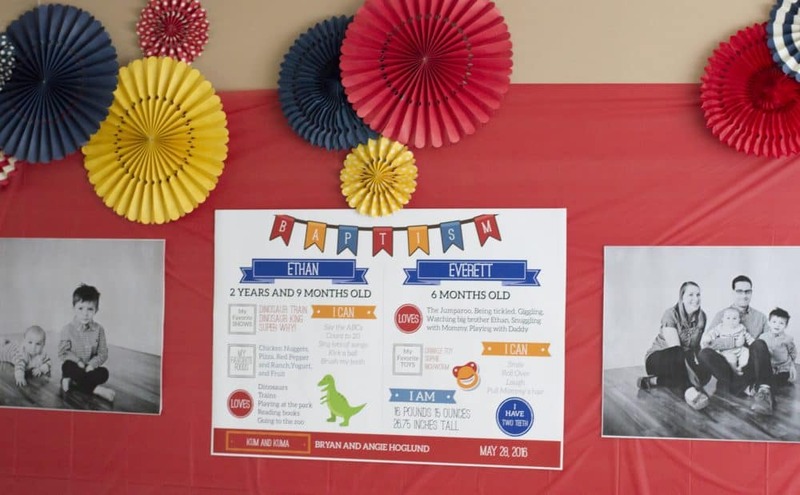 My older son, Ethan, is 2.5 and my youngest, Everett, 6 months. I wanted to find a fun theme that wasn’t too faith-based that would pull the party together. 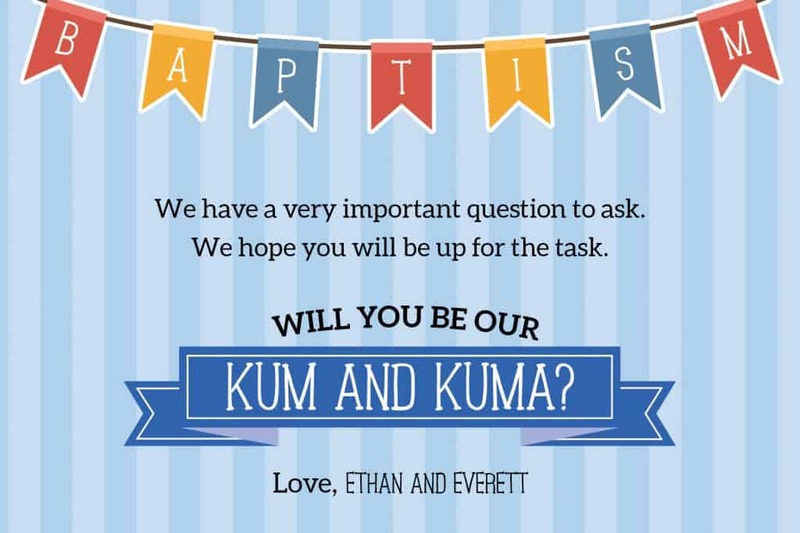 The theme started to kick off when we asked our family friends to be the boys’ Godparents, Kum and Kuma in Serbian. We sent them a little card in the mail to pop the question. I chose to stick with red, yellow, and blue as the color palette and added in burlap/kraft. I think it turned out beautiful and vibrant! The theme carried throughout the party from the moment guests walked through the door. 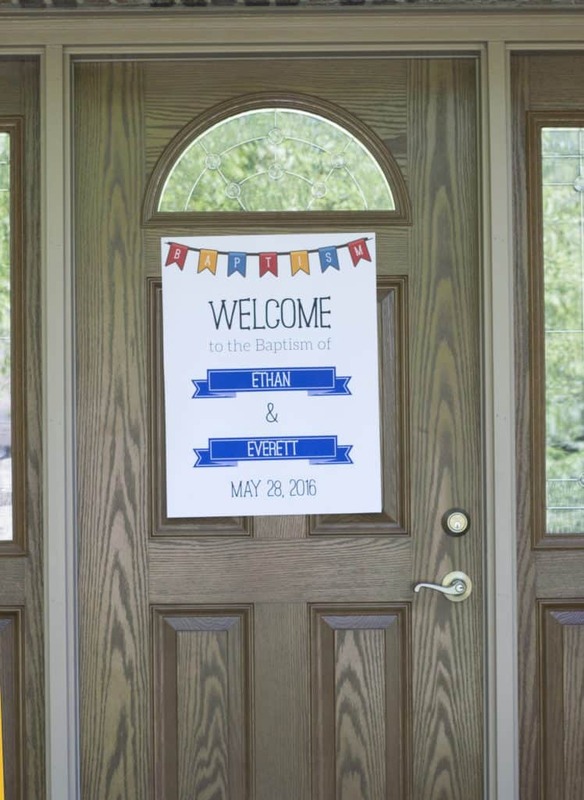 We welcomed them with a custom sign I designed and had printed at Staples as an Engineering Print. 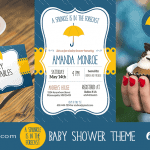 This 18×24″ sign was only $2.99 to print! Now I’m thinking ahead to parties and how I can add these to all my events! I decorated the foyer with banners I made with the boys’ names. 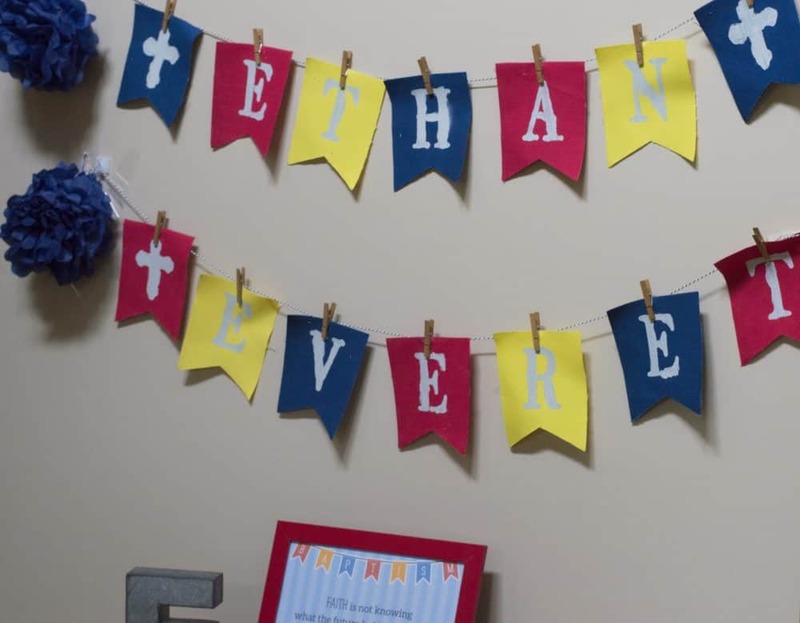 I found these banner pieces at Michaels and used paint and stencils to paint on the letters. It was harder than it looks! They aren’t perfect (I probably would have had a better result with a different brush) but overall I’m happy with how they turned out. I used clothes pins to attach them to bakers twine. These little buggers would not stay put. I think it might have been too heavy so I ended up using command hooks to tie the banner onto to attach to the wall better. I used some tissue poms to try to hide the clips, which added a nice touch. Here’s another view. I found a nice quote and made a sign. The week leading up to the party we kept watching the weather. Rain was in the forecast! But it kept changing on us so we weren’t sure what we were going to get. We decided to set up the tables inside the house for lunch just in case. The day of turned out beautiful and we were able to enjoy the party both inside and outside. We set up a dessert table in the dining room/living room where we held lunch. I wanted a fun dessert table and started thinking about the backdrop. I used a red plastic table cover as the background and hung some paper pinwheels from Shop Sweet Lulu. 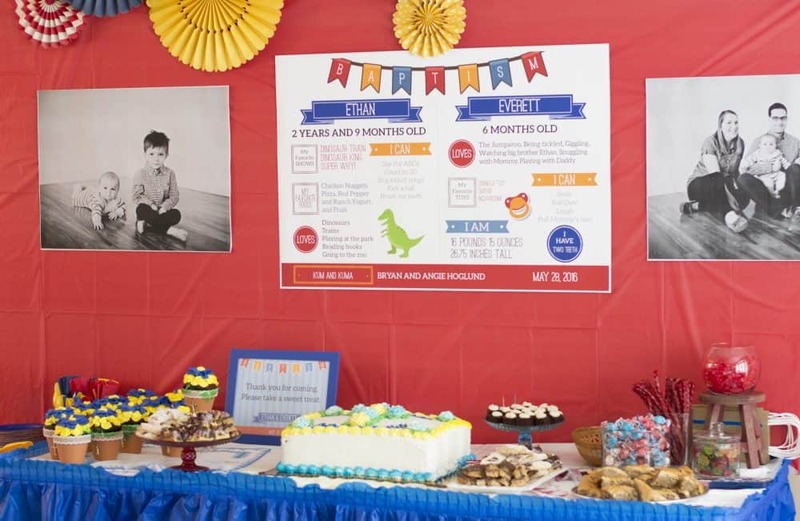 The main focus was on a “Stats” poster I created for the boys, which gave guests a little insight into the boys, from their favorite foods, toys, and activities. The poster turned out better than I imagined, again printing as a color Engineering Print at Staples. This size was less than $6. I also printed out some black and white photos as Engineering Prints that were around $3 each. I think it turned out great! 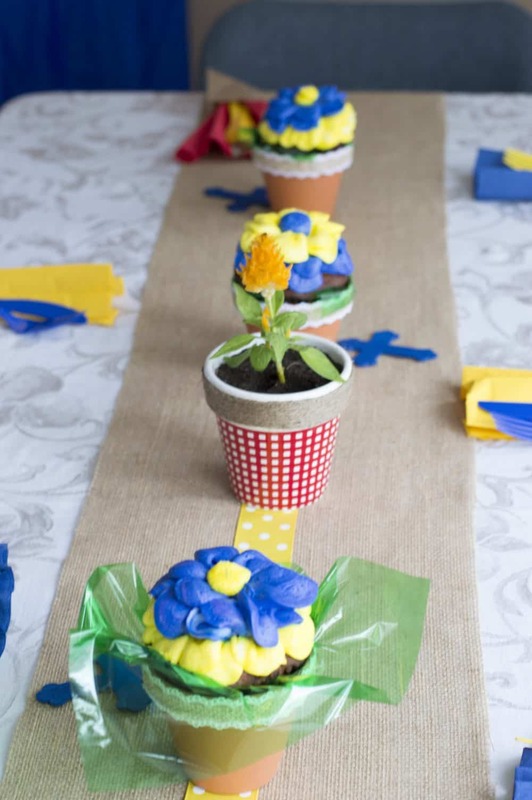 For favors we ordered cupcakes with flower frosting and put them in flower pots. They look so cute! In the family room we set up a mimosa bar in front of the fire place. This worked out well to have another “backdrop” area. I found a large letter E at a craft store and used that as the mantle focus along with some pictures I had printed of the boys. 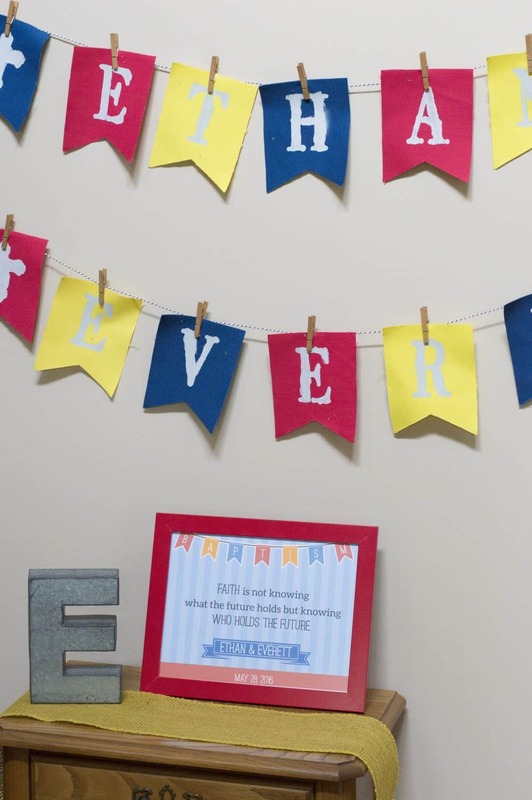 A tissue tassel banner from Shop Sweet Lulu brought some whimsy and more color to the display. I bought the garland unassembled and twisted them up myself. It was pretty easy. I plan to reuse this garland for future parties until it starts to fall apart, and will likely order some single tassels in other colors to swap in. 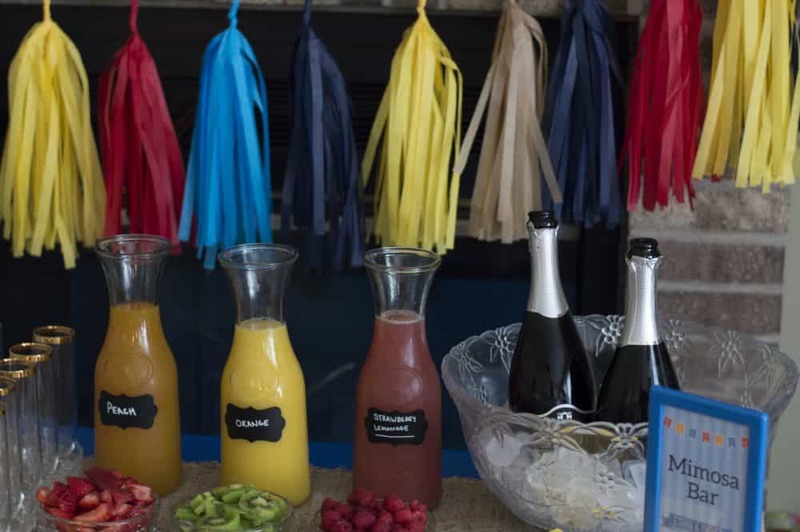 We had three types of juice and garnishes for guests to put together a delicious drink. 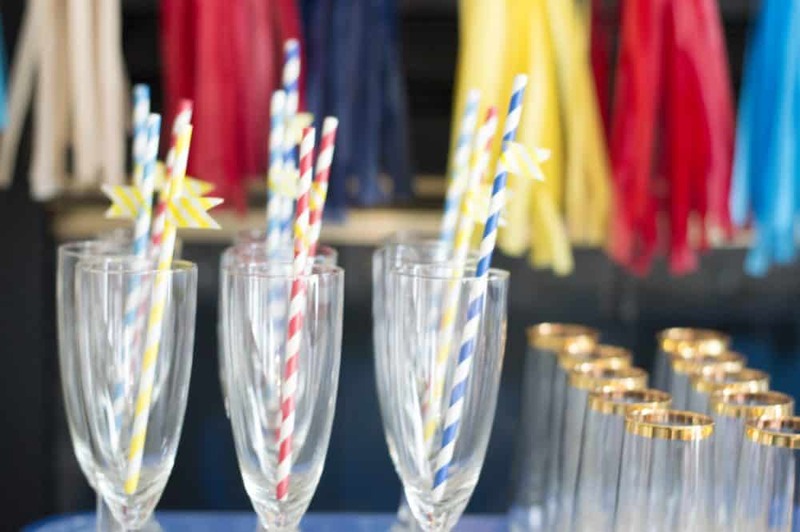 I used washi tape from Raindrop Washi Shop to create the little flags on the straws. 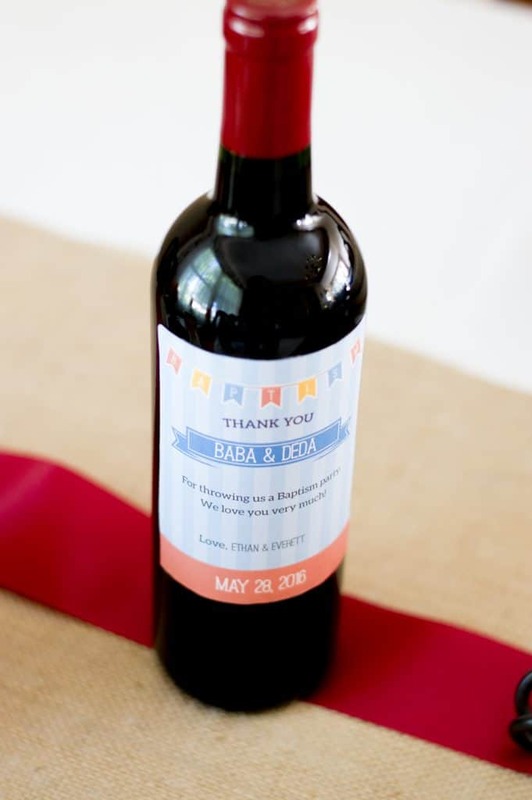 For gifts for the Godparents, we bought this set of beer and wine glasses and I created a fun custom wine label to put on a nice bottle of wine, thanking them for being the Kum and Kuma. I failed to get a picture of it, but here’s one we gave to the boys’ grandparents, Baba and Deda in Serbian, thanking them for throwing the party. 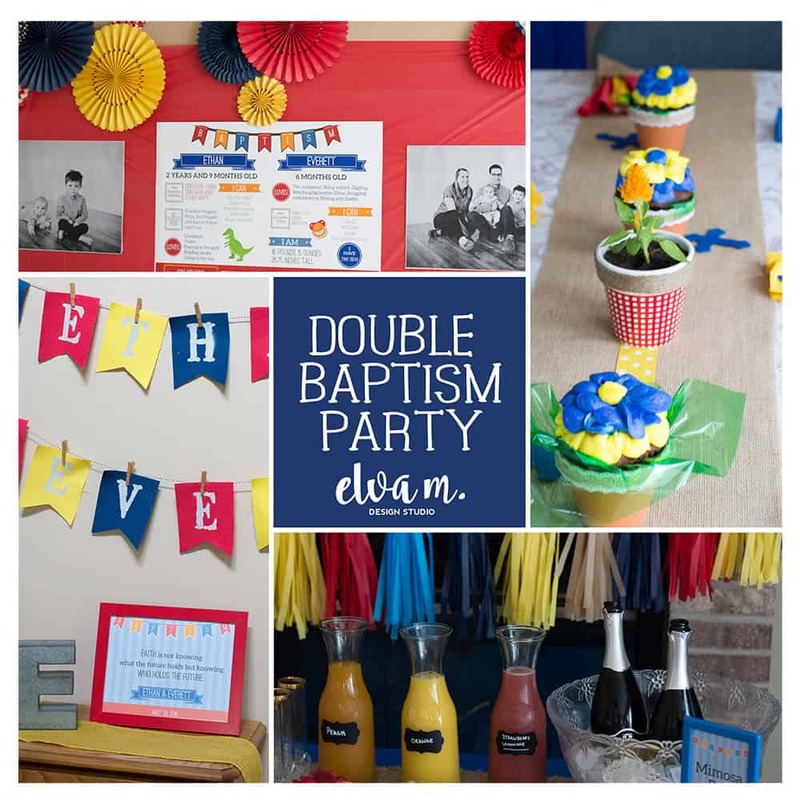 The party was so much fun, the food was fantastic, and the boys received so many lovely blessings at their Baptism. 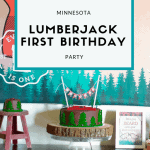 It’s always nice to be able to visit with friends and family, and a fun party theme takes the day up a notch. 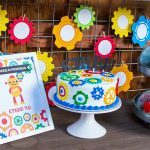 If you like this theme, visit my Etsy shop for party signs and the Godparents card.